Worldwide distribution: Temperate regions worldwide. Local distribution: Common and widespread in Britain (particularly in the South) and Ireland. Habitat: Dead elder branches. Occasionally, you may also find them growing on sycamore, beech, ash or spindle. Foraging season: All year round. 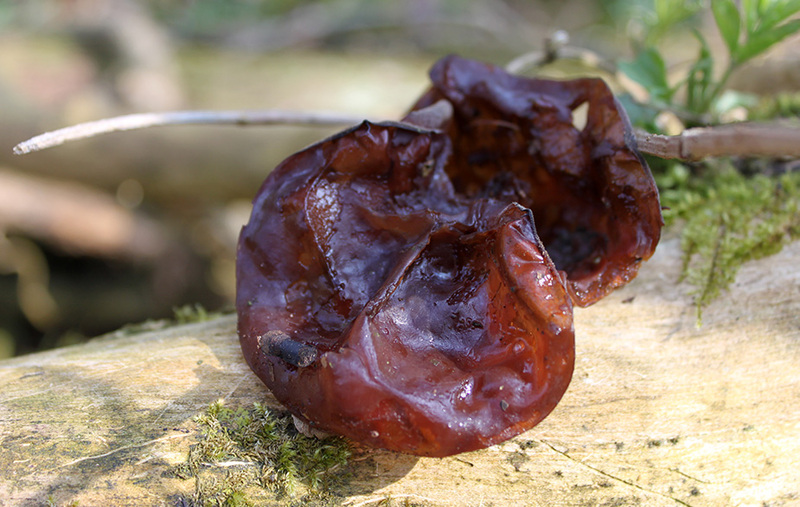 The name of this rubbery little mushroom, originally known as Judas’ ear, is a Christian reference to Judas Iscariot, who supposedly (and unlikely) hanged himself from an elder tree. The original name was corrupted to Jew’s ear and so became jelly ear eventually. The fungus is found all year round and it’s conveniently available to the forager when nothing else is growing in winter, as it is able to withstand freezing conditions. 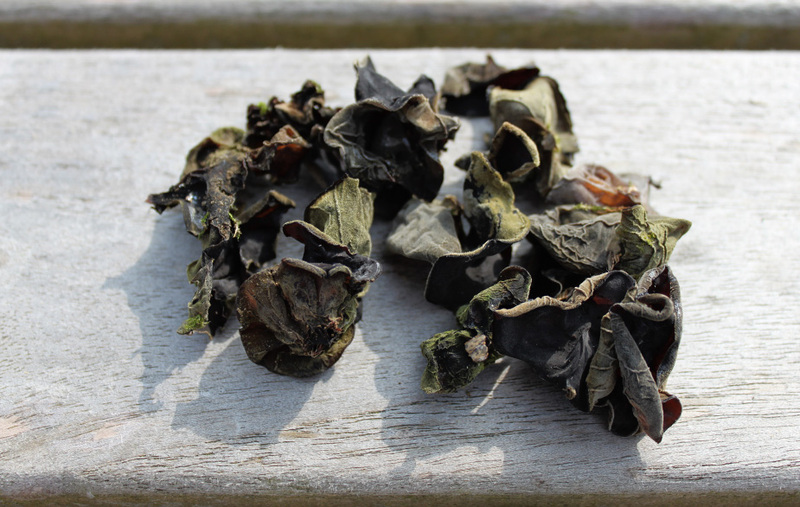 In summer, they can completely dry to easily reconstitute when soaked in water. Traditionally regarded inedible in western countries, it’s a choice mushroom much appreciated in Chinese cuisine, where the similar cloud ear (Auricularia polytricha) is commercially and culturally significant. 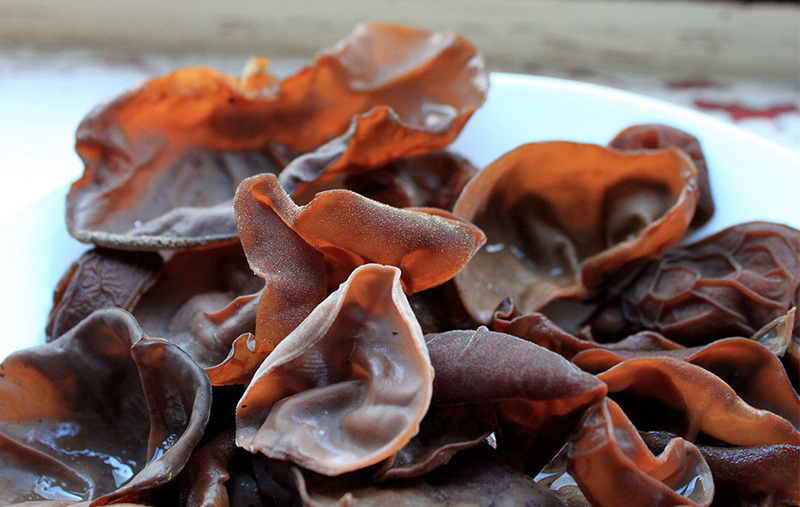 Jelly ear is one of the most intriguing mushrooms used in the kitchen. It has no flavour on its own and absorbs pretty well any character of the ingredients it is cooked with, making them a perfect vehicle for all your favourite flavours, like you would use tofu. It is a great addition to many soups and stews and absorbs flavours on spicy marinates, though the texture is crunchy and slippery, not to everyone’s taste.